Every kid remembers playing with race cars with click-together race car tracks. But these race car tracks were typically boring oval or figure 8s with no hairpin turns or S curves. 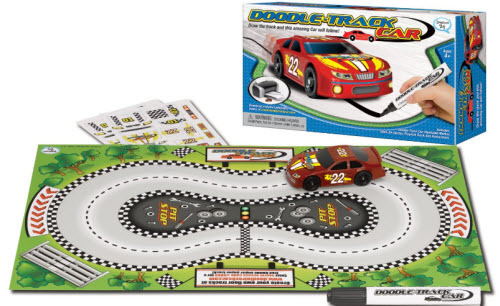 Well imagine you could design your own track using the Doodle Track kit to create the ultimate racing toy set. 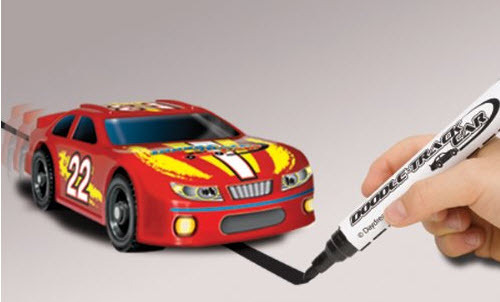 Simply using a marker you draw the track and the race car will follow it automatically. With two Doodle-Track Cars, your kids can draw tracks or have races with multiple cars. The Doodle-Track Car is a craft activity that encourages children to be creative. Children use their own large paper and draw their own tracks as the car moves. You do not have to use the marker pen included - the car will follow any thick lines, even ones drawn with crayon. You can even skip the included poster-board and use your own paper taped together or large poster-board. You can even head over to their website to design and print your own track. Race car follows a racetrack that you draw. Available on Amazon and for less than $12 it makes a great inexpensive Christmas holiday gift for kids.